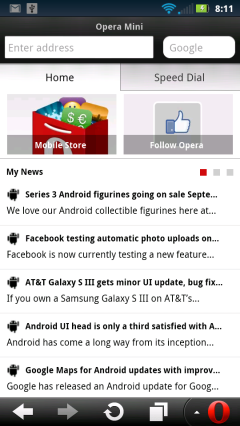 Opera Software has launched Opera Mini 7.5 for Android. The major change in this release is the inclusion of Opera’s Smart Page, which has been part of Opera Mini for Java, Symbian and BlackBerry since Opera Mini Next and Opera Mini 7.0. The goal of Smart Page is to provide users with instant access to their friend’s latest social media updates along with contextual news updates based on the user’s browsing history. As Opera CEO Lars Boilesen puts it, “There are just too many social networks, and I’m a busy man! Now, thanks to the Smart Page I can get all the updates at a glance, even from my favorite Danish newspapers. This is a real time saver!” The Opera Mini Start page now has two tabs. The first tab is the Smart Page, the Speed Dial page is on the other tab. The top of the Smart Page is dominated by two large icons which open the Opera Mobile Store and Opera’s Facebook fan page. Below the icons are three main sections labeled My News, Social Networks and Suggested links. My News is a dynamic list of headlines from sites that you frequently visit with Opera Mini. The headlines are links to the original article. There are five headlines shown initially, but swiping left reveals two more groups of five. Below My News there are four buttons that link to the Opera Mobile Store (again), Opera Sports, My Opera and the Opera News Portal. Social Networks prompts you for your Twitter, Facebook, and in some markets, vKontakte credentials and then shows a blended list of recent items from your Twitter friends timeline and Facebook and vKontakte News Feeds. Tapping a Tweet take you to it in the Twitter mobile webapp where you can reply or retweet, etc. But tapping a Facebook news item just takes you to your Facebook news feed. vKontakte isn’t an option for US users like me so I can’t tell you how its integration works. Like My News, Social networks is a slider with five updates on each of three views that you can swipe between. Suggested Linksis what you would expect, a list of links in expandable categories including News, Sports, Music, Movies, Community and Entertainment. Surprisingly there is are no Technology or Science categories. 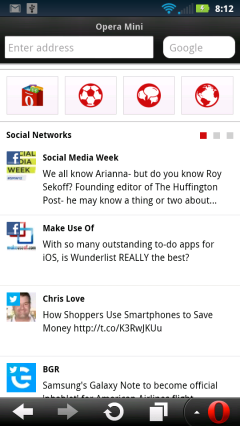 The Smart Page works well and is a nice starting point for Opera Mini users, especially new users. But I wish it was more customizable, I’d love to be able to edit the suggested links and get rid of links and buttons for sites I’m not interested in. It is possible to disable the Smart Page entirely by deselecting “Home Page” on the Opera Mini Settings page. According to Opera, 7.5 also includes some stability and downloading fixes. Opera Mini is a small, fast browser that uses a cloud proxy to compress web pages by up to 90% before they are downloaded to the phone. Compression greatly reduces network bandwidth and the cost of browsing and on slow networks greatly speeds page loading. Opera Mini supports over 3000 different devices across the Android, iOS, Symbian, Blackberry and Java ME platforms and has over 187 million monthly users. Opera Mini 7.5 for Android is now available in the Android Play Store or from m.opera.com (mobile) or opera.com/mobile/download/versions/ (PC). This entry was posted in Browsers and tagged Android, Opera Mini, server based browser by Dennis Bournique. Bookmark the permalink. download folder details for android SD card not clear. make option to customize folder on sdcard2. also lose all tabs n sessions of opera when opera is closed by mistake or goes into background. add tab save support as in Firefox. Opera you r the best. Sir, does this browser supports the HTML 5 contents? Opera Mini supports a limited subset of HTML5 features.